We, at Marwadi University, believe in the purpose of enhancing human capabilities. Our aim is to elevate the knowledge and skill of our students. We provide them with opportunities to grow and to discover their true potential. Our aim is to deliver cost-effective and quality education which will help students to experience a higher level of learning. National Assessment and Accreditation Council is the country’s highest accreditation council set up by the Government of India in 1994. They are providing grades to universities and educational institutes on the basis of their quality of education. 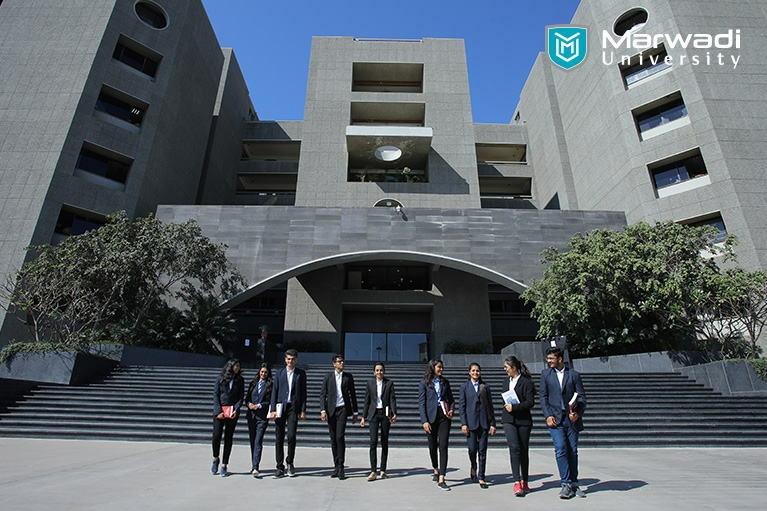 Marwadi Education Foundation received A+ Grade with a credit score of 3.51 out of 4 and is the only NAAC A+ accredit institute in Gujarat from among 400+ engineering, mba and bca colleges. We, at Marwadi University, follow the 360-degree education model to ensure that our students acquire technical and soft skills. Unique Three Tier structure guarantees opportunities to learn the educational and professional attributes. The campus comprises of 32 acres infrastructure facilities with 8 buildings, 4 acres sports complex, lakeside track for walking & jogging, 1000 capacity auditorium, health club with twin- food court. University has Wi-Fi, 190 MBPS Internet BW with Simulation & Kiosks, and computing facility with Digital Knowledge Resource & Conferencing. Marwadi University has a strong record of placements in reputed organizations like Think & Learn, Amazon, LG Soft, Coca-Cola and many others. Every year there is a constant rise in a number of companies that visit for placements in Marwadi University. There are a lot of students here who have spanned the bar of 10 LPA. There is a special team to assist international students from the initial stage of their application till graduation. The team will assist them in listening and speaking skills while teaching. They receive comprehensive accommodation with ultra-modern facilities, Wi-Fi, sports, gymnasium, health center and variety of cuisines. They are assured a safe campus with 24×7 surveillance and security officers. Marwadi University offers a friendly and academically challenging environment. We have an excellent reputation in teaching quality, learning facilities and supportive staff. For more information, Visit Marwadi University.